Congress has historically kept a liberal face at the national level and selectively pushes its pro-cow image in states. The invoking of NSA on three persons accused of cow slaughter by the Congress government in Madhya Pradesh and chief minister Kamal Nath’s immediate assurance on cow vigilantism are not mutually exclusive. In the Congress’s universe, it is called a “balancing act”. And it symbolises the very nature of the party’s brand of cow politics. How is the cow strategically placed as a symbol of the Congress’s version of secularism? The answer lies in the debates around the complete ban on cow slaughter in two different political moments: the 1950-60 moment when a ‘national versus regional’ politics of cow was nurtured; and the 1967 moment when the Congress directly appropriated the cow issue to get involved in the ‘Hindu appeasement’ politics. The legislative debates in the aftermath of Partition – in the Constituent Assembly and in the first Lok Sabha – on the issue of cow protection mark the first moment of the Congress’s cow politics. There were two factions in the Congress. Former Prime Minister Jawaharlal Nehru supported a group that was in favour of the radical reconstitution of agricultural economy and animal husbandry on modern and scientific line for the improvement of cattle wealth. 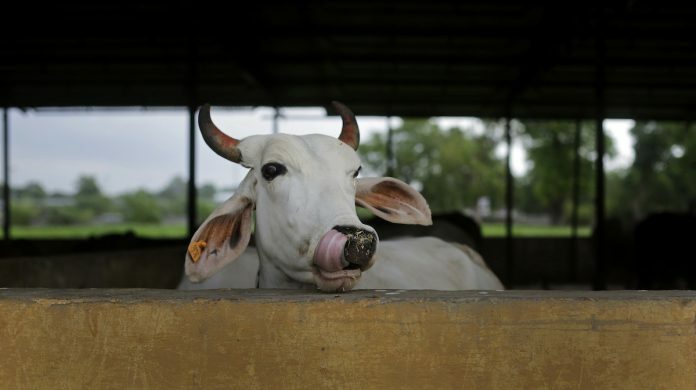 The Congress’s Hindu traditionalist faction led by P. Tandon, Seth Govind Das and Pandit Thakur Das Bhargava, however, demanded that the state must preserve cow as a national animal. It was argued that production of milk should be prioritised over the consumption of meat for the better health of the nation. A workable political strategy emerged in the mid-1950s. The central government under Nehru continued to adhere to the economic viability of cow argument. The first two Five Year Plans (1951-1956 and 1956-1961) also rejected the proposal for the total ban on the slaughter of cows and other cattle. In fact, the first Five Year Plan categorically asserted that such a prohibition could adversely affect the agricultural economy. It noted: The available feeds cannot adequately sustain the existing bovine population. While there is a deficiency of good milch cows and working bullocks, there exists a surplus of useless or inefficient animals; and this surplus, pressing upon the scanty fodder and feed resources, is an obstacle to making good the deficit. But a number of Congress-ruled states, especially in north India (Uttar Pradesh, Bihar, and Madhya Pradesh), took a very different position and adopted stricter animal preservation legislations within a span of ten years. These laws not only imposed a complete ban on cow slaughter but in many cases prohibited the killing of other bovine animals. Such an extensive ban on slaughtering of big animals (cows as well as buffaloes) affected the livelihood of a number of communities (mainly Muslims and Dalits) associated with meat trade and auxiliary industries. Indira Gandhi gave a new direction to the Congress’s cow politics in the late 1960s. By that time, the RSS/BJS had already gained acceptability as a champion of cow politics. The famous agitation by the sadhus near Parliament House in November 1966 for a complete ban on cow slaughter (in which seven protesters were killed and more than 100 injured) was an outcome of the RSS-supported cow movement. But the Congress did not allow the Bharatiya Jana Sangh to make use of this incident in the next election. The government set up an official committee (the Sarkar Committee) on cow protection and invited the representatives of Sarvadaliya Gau Raksha Maha Abhiyan Samiti — an organisation established by the RSS and supported by other Hindu groups — to look into the modalities for a national ban on cow slaughter. The new election symbol of Indira-led Congress in 1969 should also be seen with regards to the Congress’s obsession with cow politics. When the Congress (O) claimed ownership over the party’s old symbol — a pair of bullocks carrying a yoke — after the split in the Congress, the Indira Congress adopted the ‘Cow and Calf’ as the party’s new symbol. The party even went ahead with an interesting slogan: Vote for Calf and Cow, Forget all others Now. The contemporary cow politics of Congress stems from this historical legacy, which has two core elements. First, the Congress’s approach to accommodate ideologically different groups/individuals on the issue of cow has always been a conscious choice. It has helped the party to create a balance between ‘Hindu appeasement’ and ‘Muslim appeasement’. Second, the Congress keeps a liberal/secular face at the national level, while it takes very different positions in the states. This ‘politics of convenience’ helps the Congress establishment get adjusted with the electorally beneficial issues at the state level. For example, the pro-cow gesture is only significant in the Hindi belt, where cow slaughter is always understood in terms of Hindu-Muslim conflict. But this attitude is useless in southern India or, for that matter, in north-eastern states. The Congress’s cow politics is going to survive. Unlike the BJP (which hesitates to approach the Muslims directly), the Congress finds it easier to accommodate the Muslims as well as the ‘cow worshippers’ in its fold. By appeasing radical Hindutva, especially through the symbolism of cow, the Congress wants to appear as if they are releasing the pressure. This re-establishes the national image of the Congress as the sole saviour of Muslims’ lives. The author is an ICSSR Fellow at CSDS, New Delhi.